Vancouver Point Grey: The Carbon Tax does not reduce GHG nor does it Invest in Renewables. The Carbon Tax does not reduce GHG nor does it Invest in Renewables. I believe strongly in protecting the environmental. I have been advocating using less petroleum for decades. I have argued for better alternatives for Canada and other countries, working within various organizations We have alternatives and we have better ways to reduce pollution of all types. I commute on bikes more than cars and do everything I can to leave a smaller footprint in terms of energy used. 3. Is merely a tax that "redistributes" wealth. It is "revenue neutral" meaning it does not put money into government coffers. Carbon tax – as announced in Budget 2008, the carbon tax rate per tonne of CO2 - equivalent will increase by $5 each year to $30 per tonne by July 1, 2012. The forecast assumes that purchased volumes of natural gas will grow by 2.0 per cent annually, while consumption of gasoline is expected to remain constant. Revenue is expected to increase in line with these higher rates and assumed volume growth. I went to read the rest of the Carbon tax propaganda and found the projections for 2012-2015 (use this link and look at page 68). So are other political parties telling us that the carbon tax is working when it is not? Or are the 2012-2015 BC Budgets based on flawed assumptions? Either one of these statements could be true but they cannot logically both be true. It appears the worst case scenario has happened and neither one is true. Most of the claims that it works come from three studies, of which I will contend may be flawed. The costs of which will inevitably be passed off to you and I, the consumers of anything that is affected by the rise in the price of petroleum. Additionally, this carbon tax will put BC businesses at a disadvantage in a global economy yet will not stop the emissions of carbon. I am not the only one to notice this. People are waking up all over. While the government is claiming that we have let less GHG's into the air than other provinces between 2008-2010, even accounting for some of the general economic recession, they never factored in the completion of the Canada Line of Skytrain that carries really 40,000,000 riders per year (source: Translink) and the ceasing of cement production when our Olympic Infrastructure was completed. 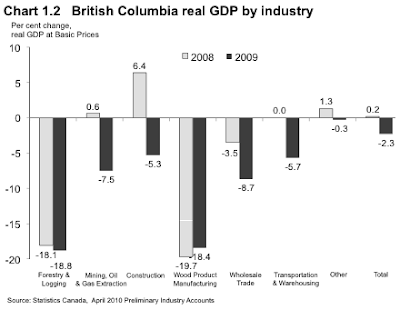 The claim is that between 2008-2010 the GHG gas emissions fell by 4.5% in BC. The facts do not support this. Greenhouse gases are measured by volume and are correlated to various GHG emitting products manufacture or consumption. The algorithm used is linear. While it is possible that the manufacture of concrete and use of fossil fuels actually did fall by 4.5% in that period, the general economy sank by 2.3% in 2009 alone, construction went from a 6.4% growth in 2008 to a 5.3% reduction in 2009 alone and retail sales fell by almost 5%. This chart is from Statistics Canada data. It might be time to start over. BC is part of a global economy and a global environment. We have a commitment to everyone on this planet to help reign in pollution. Using less energy in our daily lives can have an impact and we need proactive programmes that actually develop renewable energy policies. I have been lucky enough to work with the US Department of Energy and visionaries like Saul Griffith. If you want to get some facts, watch Saul's talks on Climate Change Revisited. Saul is bright and has done a lot to change the world for the better. One thing we discussed at great length was where change is most effective. The problem is that change is often not most effective at the National level. The Provincial level, for large infrastructure projects, is where change may be best directed. Some examples of this are Sky Train and Hydro-electric power projects. The myth that solar energy can save BC is just that. Doing the net calculations on manufacturing the solar panels will often show a less than favorably return, certainly short of our needs. We are blessed with an abundance of cheap, renewable energy sources and a smart and innovative population. Wind, Hydro, Geothermal and Solar used in combination can be very effective but reducing GHG's requires a reduction in the use of hydrocarbons period. Replacing cheap and plentiful Hydro-electric power with solar power may actually cause more pollution given it is the energy produced is replacing green energy and not targeting hydrocarbons. We have the ability to also develop Geothermal energy. While serving on the US DOE's National Geothermal Data System as a technical monitor, I noticed that the heat flow potential for Geothermal energy seems to increase as it goes northward into BC. We can do this. If done correctly, based on the input of organizations like the BC Sustainable Energy Association (BC SEA), we can create ways to develop renewable energy source, green cement and build green industries. Vote BC Conservative Party on May 14, 2013. We will try to repeal the Carbon tax and replace it with public policy that actually reduces carbon and/or creates renewable energy sources. Do not believe the parties that tell you the Carbon Tax is working as it is. It is clearly not. Be a scientist! Ask questions and educate yourself. We have alternatives. No more faux taxes. Let's take real action. Help us fix this. Join our cause and donate. Be part of a solution.